The dining room decor for Christmas is a little different from the traditional colors through the rest of the house, but I wanted the table setting to blend with the colors in the room. I'm not hosting this year, but like to do a table setting just for fun. Leftover ornaments, from going to a much smaller tree, ended up in this wired bowl sitting on a silver tray and it all sits on a vintage grain sack used as a runner. I've had the two white deer for years and they are starting to show some wear. Bought the plates at HomeGoods last year. Love the winter scene. I found these pale green ticking napkins on sale at Pottery Barn and had to have the silver rings, too. I do have family visiting again at Christmas so who knows maybe we will eat in here, too. Oh, probably not since three of them are under the age of four. It's safer in the breakfast room. 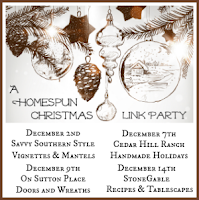 Yvonne, at Stone Gable is our last hostess for A Homespun Christmas link party series. She is hosting tablescapes and recipes. Be sure to share your pretty tables and yummy recipes at her blog starting around 8 pm eastern time tonight. The sun is finally back today so I can start taking more pictures. Wow Kim! The room looks fantastic! Your last photo could grace the cover of a magazine! I absolutely love the the china cabinet. Maybe you should do some e-books on painting techniques? Love everythinng about the table setting. Kim everything looks wonderful. LOVE all your ironstone and those cows! So pretty Kim!! I just love the centerpiece you created! Kim, I'm enjoying the soft and soothing nature of your dining room. Very pretty! Kim, it's a lovely peaceful winter dining room! I love the winter place settings...the print on the dinner ware plaes is so pretty. I really like your centerpiece. Of course, the grain sack in the center is my fave! Like your cute napkins and woven chargers too. This is lovely. So vintage and refined at the same time. Where did you get the chargers? I looked for some before Thanksgiving and couldn't find what I had in mind. Yours are fabulous. What a beautiful setting. I love the silver and those plates are just gorgeous. I love the winter scene. What a beautiful and serene Christmas table setting. This is so so pretty! I'm in love with the basket weave chargers under the plates! Love the texture they add. beautiful Kim.. a joy to look at. Merry and Bright to you and yours~! Gorgeous Kim! Love the dishes and the tablescape colors. Very pretty. Kim...you did it again...a beautiful table!...As I am viewing this spectacular table, I feel as if I am taking a walk in the snow...through the woods...and there is not a sound....complete calm...serenity...that is what your table presents..So love it! Kim...It looks wonderful! Where did you get your place-mates? Love them! This is really unique and fun! I may need to find me a wire basket. . .
so gorgeous Kim! love the winter scene plates. Stunning! And oh how I love the basket and the sweet deer. Hi Kim, When I see your dining room I always think "this is my favorite room of yours" but then I see another of your rooms and I feel the same way. Your dining room is so lovely. I love the soft colors. Happy Holidays! 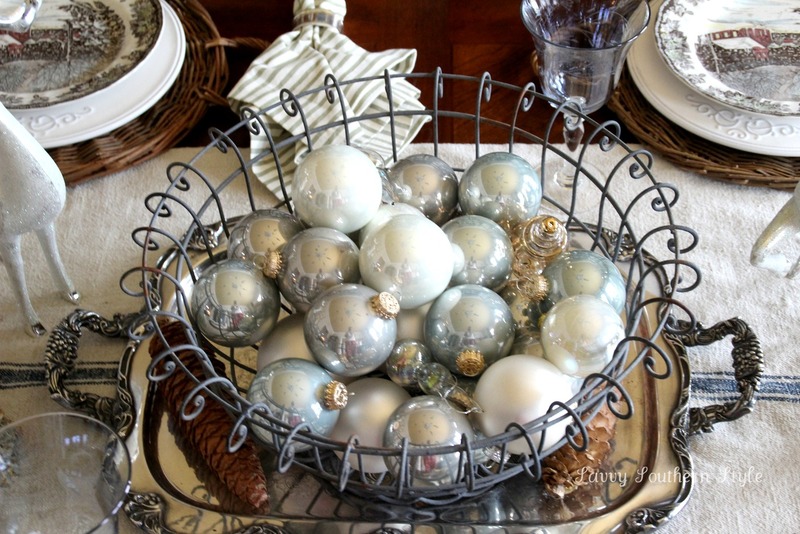 Pretty Table, I love the soft colors of the ornaments...they look stunning in the wire basket! Your tablescape is so pretty!! Love the white deer. OMG! the china cabinet blown my brain away. That's absolutely gorgeous. I honest drool to the max. BTW, you are one of the inspirations in blogielandia. Love love those dishes. Augusta has got to get a Home Goods. Love the table and centerpiece! Kim your tablescape is beautiful! LOVE those ornaments at a centerpiece too! I always enjoy seeing photos of your beautiful ironstone collection! The table looks wonderful Kim. I love those plates. The kitchen table in one of the houses we toured Sunday was set with those. Your dining room looks gorgeous, Kim! Absolutely stunning! I'm totally into the deer theme this year and have them in my dining room. Although they may be a few years old, I think they only get better with age. Lovely, lovely table. I think a lot of us had extra ornaments going to a smaller tree this year. Stunning and serene! Your table works perfectly with your dining room! I love the bowl with all the baubles!!! Thanks for celebrating a HOMESPUN CHRISTMAS with me. The four of us make a pretty good group!!! Beautiful Kim! I love the soft blue stemware and how it picks up on the blue in the ornaments. The deer look wonderful! Kim your table is so beautiful. I've decorated with alot of silver and mercury glass this year too! We posted a "Friendly Village" tablescape this week too. I am just in awe of EVERYTHING!!! Just lovely to say the least....beautifully put together and each and every element strikes my fancy! Thank you for the lovely photos and for taking the time to post and share all your gorgeous displays. Most of all, thank you for spreading some joy via cyberspace for people like me who are alone during the holidays... it sure made a bright spot in my day!